The undermanned Nashville Predators gave all they had to give but lost 2-1 to the Columbus Blue Jackets Tuesday night at Nationwide Arena. The Predator’s effort and desire could not be faulted but a couple of defensive breakdowns in front of goalie Pekka Rinne led to two goals that were more than the battered Predator line up could overcome. The Predators got on the board first at 8:28 in the first period when Steve Sullivan slid a perfect pass through the slot to Cal O”Reilly who was skating toward the opposite side of the net. O’Reilly lifted the puck past Steve Mason for his second goal since his recall from Milwaukee last Thursday. As the seconds ticked down in the first period some type of missed defensive assignment between Ryan Suter and Shea Weber led to R J Umberger scoring on a rebound to tie the game. Pekka Rinne’s stellar efforts in goal was the only thing that kept the game from getting away from the Preds early as the Jackets out shot the Preds 17-6 in the opening stanza. The second period was scoreless with few scoring chances by either team. It was obvious that both teams were feeling the pressure of the situation as the Preds out shot the Jackets 9-5 for the period. Pekka Rinne exhibited the most emotion yet in a Preds uniform when the defense allowed Raffi Torres to slip a rebound past the big goalie at 4:05 in to the third period. Rinne was obviously frustrated that he had stopped the initial shot by Michael Peca on a two on one breakaway but was unable to avoid the rebound goal. That goal would be the difference to give Columbus the victory and open a four-point bulge between the two teams. After Torres’ goal, the hearts of Pred fans everywhere stopped beating when J P Dumont was violently boarded by a pair of Blue Jacket players and laid on the ice for several minutes. No penalty was called by the officials which was amazing considering the linesman was in the middle of the play. A couple of calls immediately went against Columbus that many would consider to be of the “make-up” variety. The Predators power play unit was unable to convert in spite of a couple of chances by Mike Santorelli and Joel Ward. Thankfully J P Dumont was able to return to the ice as he appeared to have merely had the breath knocked out of him. The Predators played their heart out attempting to tie the game but had few scoring chances, as they were out shot 11-7 in the final period. The goalie match up between rookie phenoms, Rinne and Mason was everything it was cracked up to be. On this night, Mason was tested less and did not have the breakdowns in front of him that Rinne had to endure. Rinne may have been the better of the two as he stopped 31 shots to Mason’s 21, but Pekka came up short in the win column, which is the only thing that mattered. With the loss, the Predators remain in seventh place for the moment with 84 points, one point ahead of St Louis. Before the evening is over they potentially could fall to eight if Anaheim is able to defeat Edmonton in a late game. The Predators injury situation worsened as Antti Pihlstrom left the game after three shifts with an “upper body injury”. With Captain Jason Arnott, David Legwand, Marty Erat, Ryan Jones and Wade Belak already on the shelf, losing Pihlstrom further compounds a dire situation. Early reports from radio man Tom Callahan on the post game show indicated Pihlstrom appeared “OK” on the bus. The Predators returned to Nashville after the game to regroup before heading to Chicago for a Friday night match at the United Center. Then they will fly home for the final showdown of the season with the Blue Jackets on Saturday night. After winning three in a row and gaining points in their last eight games, the Predators will need wins in three of their last five games to get to the ninety point mark which should be good for a playoff berth. The Nashville Predators are set to play the Columbus Blue Jackets at Nationwide Arena Tuesday at 6 p.m. The Predators are flying high after a huge come from behind win at Detroit on Sunday. A week ago, no one could have imagined that this game would be a battle for sixth place in the West. The Predators have had points in their last eight games going 5-0-3 in that span. Columbus is coming off back to back losses to St Louis over the weekend. The Western Conference race now features all five Central division teams in the top eight. Detroit and Chicago’s playoff spots are secure. Columbus is now in sixth place with 86 points. The Preds are two points back at 84 and the surging St Louis Blues are a point further back at 83. Five teams from the same division have never made the playoffs in the same year, so history could be made with a division most experts considered weak when the year started. The Predators win against the Wings on Sunday came with a price. Mary Erat received a broken leg when he was struck by a Shea Weber slap shot midway through the game. Erat joins Captain Jason Arnott, David Legwand and Ryan Jones on the injury list. It is probable that Jones may be the only one of the four that will be able to return during the regular season based on the current prognosis. For most teams, losing four top players would be devastating but the Predators seem to have risen to the occasion. Steve Sullivan commented on what winning without key players meant after Saturday’s win over the Kings, “It is a real big deal. We would love to have those guys back in the lineup. That being said, there are twenty guys in the lineup that put the jersey on and go to war every night and all have the same goal in mind and that is two points”. Rookie Cal O’Reilly has been one of the twenty after being recalled last Thursday to replace Legwand. He has played well in three games, picking up a goal and an assist while centering the team’s second line. Mike Santorelli was recalled from Milwaukee of the AHL on Monday to fill Erat’s slot. Santorelli has 27 goals and 43 assists with the Admirals and posted a hat trick in his last game on Sunday night. He played an uneventful six games with the Preds earlier this year. Since the All-Star break in January, the Preds are 18-7-5 and appear to be a team of destiny. Barry Trotz truly deserves to be considered for coach of the year honors if the under-manned Predators hold on and return to the playoffs for the fifth year in a row. After Tuesday’s showdown in Columbus, the Preds travel to Chicago for a game Friday night before heading back to the Sommet Center Saturday night for return match with Columbus. Tonight's show at 7:00 Central on Blog Talk Radio is ready to roll. The Predators are also on a roll after back to back wins the last two nights and getting points in their last eight games. Our lead story is obviously the push for the playoffs and where things stand and the Preds improving chances of making the playoffs as documented at SportClubStats. Can you believe five teams from the central are in the top eight? The Blues are hot - two stories one two. We have been able to reschedule Jason Gregor from The Team 1260 in Edmonton to discuss the Western Conference race and the Oilers. He regretted not making it last week but his PM drive time show was extended due to an Oil Kings playoff game. As Section303.com points out today the Preds have surpassed the 2 of 3 winning standard since the all-star game going 18-7-5 since then and 4 of 6 would give us a 99.8% chance of the playoffs. Speaking of Section303.com, Their inaugural podcast was a high quality production and is a must hear for hockey fans everywhere. We hope to have Jeremy on tonight to give us the story of how it came about and what to expect going forward. We will touch on big wins over the Sharks, Kings and Wings and the OTL to the Ducks in the last week. The Forechecker does a much better weekly wrap up so if you don't want to keep reading go here. Injuries to Jason Arnott, David Legwand, Ryan Jones and now Marty Erat is out for a month. John Glennon delivers the bad news on Legwand's situation and the recall of Mike Santorelli. What about Cal O'Reilly as a replacement? What a great kid, even got his picture taken in front of the Sommet Center. I have a story coming out in the Columbia Daily Herald tomorrow about Barry Trotz dealing with adversity. He is having a lot of practice at it. Tomorrow's game against Columbus is huge since with a win we can move into a tie for sixth. I am still lining up a guest from Columbus for the show. Steve Mason now has 10 shutouts but lost the last couple of nights. Boomer on NHL HomeIce is really pushing for Pekka to get the Calder. You have to hand it to the Blue Jackets for the signing of Ryan Salmons (Family Blog) a teen hockey player who is undergoing treatment for cancer. He has been deemed the BJ's most significant player and the team is developing jerseys for sale with his name on it. Here are a story here . Talk about fans, this Flames fan went crazy and threatend Steve Mason during last weeks Flames - Blue Jackets game. Puck Daddy also weighs in on it. Mirtle has a great story on Steve Sullivan today and wrote on him as a Masterson Trophy candidate too. Bruins writer Jesse Connelly takes a look at the post season awards race. Sully for Masterson again! Earth Hour was different on Saturday. Rachel from WhatThePuck gave a preview and the Tennessean had cool pics today. The Predators web site had a good article on the Preds goaltending history and also has a place to vote on the Top 10 moments of the year. Forechecker did the math today (as always) and reports that the Preds are a lock on the 14k paid attendence goal. Forechecker, Mirtle and John Glennon got me all wound up last Thursday and I called Gary Bettman on the NHL hour about the "Mixed Martial Arts" moves that Brad Staubitz put on Jordin Tootoo he ducked the question. Imagine that. We will listen to what he said. Jackson disagrees with me on this one. Bettman also commented on the NHL Awards ceremony at $550 a ticket. Ray Emery is back in Canada and is already in trouble - two stories one two. Scott Harnell wig night in Philly was a big success. If Chicago and Vancouver meet up in the playoffs, watch out. Here's the brawl from last night. The Hawks may be chearing for the Nooks to move into third. USA Today has a poll saying Ovie will repeat for the Hart. Jackson thinks Malkin will win. Always a Twitter story... Mark Cuban fined for Tweeting about officiating in basketball. Don Cherry, watch this, a goalie celebration that makes Ovie look calm. And here's a top ten of celebrations. Ovie takes it all in stride here and here. I love XM HomeIce's Mick Kern's Ovie saga. After all we have been through with ownership changes, you have to feel sorry for Phoenix fans and their situation. Boots Update - His pal is scummier than he is. Good guy Chris Mason got the NHL first star of the week going 4-0 and leading the Blues surge. He had a great interview on XM HomeIce with Phil Esposito this afternoon. Hopefully they will post it here. And finally we would like to thank Mark Willoughby from The View From 111 for spending the entire hour with us last week. If you haven't heard it, skip this week's show and listen now. He was that good. So join us tonight for some of this and more. You never know what will happen. Preds! You Leave Me Breathless! As I headed toward the bed to prop up and watch the Predators play the Red Wings at Joe Louis Arena, I was completely unprepared for what I would soon witness. 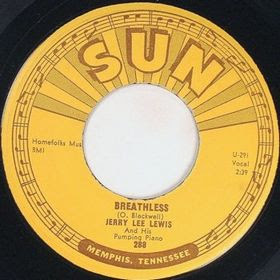 I was hopeful for a win but could not imagine that I would experience the emotion that Jerry Lee Lewis wrote about 41 years ago. The Nashville Predators continued their march toward destiny with an incredible “return from the grave” 4-3 comeback victory over the Detroit Red Wings. The win combined with St. Louis’s back to back wins over Columbus has completely reshuffled the Western Conference race with five Central Division teams currently in the top eight. The Preds now have 84 points and are only two behind Columbus, who they play on the road Tuesday night, and are a point ahead of the surging St Louis Blues. Against the Wings the Predators came out and scored first, 2:25 into the contest when Steve Sullivan slipped a shot past Chris Osgood on the power play. The Wings answered quickly two minutes later on a short handed goal by Henrik Zetterberg. The Wings appeared to have scored again in the closing seconds of the period when a goal was waived off by the “eye in Toronto” saying that Johan Franzen had kicked the puck past Pekka Rinne with his skate. The second period was not a good one for the Predators when they were out shot 16-3 and were really showing the fatigue of all the overtime games they have played over the last two weeks. A couple of sloppy penalties put the Wings on a five on three advantage at the 13:59 mark. With one second left before getting a player out of the box, Pavel Datsyuk sent a cross ice pass past Vern Fiddler and allowed Mikael Samuelson to hit the open side of the net. It was the league leading 12th 5 on 3 goal given up by the Preds this year. By the end of the period I really felt that the Preds were lucky to only be down 2-1. The Predators continued to play on emotion and stay close as the third period began. In spectaular fashion, Joel Ward broke through with a game tying goal at 11:35 to make the score 2-2. Before I could catch my breath, twenty seconds later, Jerred Smithson knocked a puck free in the Wings zone, recovered it, and sent it to Cal O’Reilly who in turn passed it back to Smithson who shot it cleanly into the net. All the energy loss shown by the Preds in the prior period was replaced by pure adrenaline. While I was trying to regain my composure, I got an assist from Johan Franzen who re-tied the game at 14:35, 3-3. As I surfed over to SportClubStats to see what one point would do for us in the playoff chase, I was stunned to see that Jordin Tootoo had lured Chris Chelios into what seems like the hundredth penalty Tootoo has caused Chelios to commit. Chelios really does not like Tootoo at all. As the resulting power play unfolded, Steve Sullivan found Ryan Suter near the blue line. He put the shot on net and gave the Preds a 4-3 lead that would hold through the remainder of the game. The rest of the game was indeed breathless hockey as you were afraid to exhale for what might happen. As the final seconds ticked down, a clearly frustrated Wings team jostled with an elated Preds team to bring the contest to an incredible conclusion. Pekka Rinne was outstanding in stopping 33 of 36 Red Wing shots. He was especially stingy in the closing moments as all you could see was Pekka surrounded by a sea of players wearing red. He must have had x-ray vision to have been able to see through all the screens that we couldn’t seem to clear out. The one real downside to the game was a “lower body injury” to Marty Erat halfway through the contest. I would speculate that he will be listed as “day to day” at best, as he was truly hobbled (ESPN now reporting a fracture and out 4-6 weeks). The one thing the Predators did not need was an addition to the injured list which already includes Captain Jason Arnott, David Legwand and Ryan Jones. I would suggest that Mike Santorelli start packing because he will be getting a call, if he hasn’t already. After a much needed day off on Monday, the Predators will play Columbus at Nationwide Arena on Tuesday night with a chance to tie for sixth place. They then travel to Chicago for a match Friday night before heading back to the Sommet Center Saturday night for another game with Columbus. As the season seemed to have slipped away after an embarrassing loss to Atlanta and a listless loss to the New Jersey Devils in the last two games before the All-Star break, no one could have imagined that we would be sitting on 84 points with six games remaining. Since the All-Star break, the Preds are 18-7-5 and appear to be a team of destiny. Barry Trotz truly needs to be considered for coach of the year honors if the under-manned Predators hold on and return to the playoffs for the fifth year in a row. The Nashville Predators overcame a gritty Los Angeles Kings team to win in overtime by a 4-3 margin. Steve Sullivan buried a power play slap shot from the left face off circle 3:41 into the extra period to clinch the victory, giving the Preds a 4-0 sweep of the Kings on the season. The Predator fans came to the game in mass expectation that the Predators would win. The sellout crowd was electric right from the start. The “Earth Hour” generated early start time seemed to add to the excitement. During the game tornado sirens raged outside the Sommet Center as the area was surrounded by threats of tornadoes, hail, and torrential down pours. Predator fans were unphased despite thousands of tweets and texts warning of high danger. Los Angeles came into the game with nothing to lose while the Predators were fighting for their lives in the Western Conference playoff race. Barry Trotz said, “LA is a game that you really get nervous about. LA has a young team that’s playing very well. I’ve been watching them the last few games. They play with a lot of structure. They are a very hard team because they deflect the attack, a defense first kind of team. They have a real good team concept and they give up the second least amount of shots in the National Hockey League”. The Predators seemed stymied by the Kings right from the start. The Kings did a good job of limiting the Predators chances and pushing the puck into the Pred's defensive zone much like Nashville has done to it’s last two opponents. The Kings scored first on a goal by Brian Boyle seven minutes into the game. The Preds newest star, Cal O’Reilly, tied the game when he took a feed from Steve Sullivan and fired the puck past King goalie, Jonathan Quick, at the 14:24 mark for his first NHL goal. O’Reilly was excited after the game, “It’s a good feeling especially a tying goal, it takes a weight off of my shoulders to get the first one”. Matt Green put the Kings back in the lead at 8:58 in the second. The Kings continued to do a good job of limiting the Predators scoring chances and finished the period with a 2-1 lead. The game was headed deep into the third period when Radek Bonk was called for holding at 5:08. The Kings power play unit was aggressively attacking when Joel Ward laid down in the slot to bock a Kings shot and then got up and skated the length of the ice just in time to take a feed from Marty Erat to score the short-handed game tying goal. Ward described the play, “It was an unbelievable pass. I just had to make sure I got the stick on the ice to get as much of the puck as possible to put it upstairs where it had a good opportunity. Five minutes later, Shea Weber took a pass from Steve Sullivan near the blue line and blew it past Quick into the upper left part of the net to put the Preds in the lead for the first time of the night. When asked about the shot, Weber said, “I shot it and it went in. I had the whole end (side of the net open) so I was trying to shoot it there”. After a rousing TV time out with the fans screaming at high decibels throughout, the Preds appeared on their way to victory. With 64 seconds left, Jack Johnson calmed the crowd with a goal to tie and force an overtime period. With a point secured, in overtime both teams played aggressively skating end to end. At 2:41 during a flurry in front of the Predator net, Anze Kopitar was called for goaltender interference after falling on Pekka Rinne. On the subsequent power play, Marty Erat secured his fourth assist of the game on a pass to Steve Sullivan who ended the contest with his ninth goal of the season. The entire Predator team mobbed Sully in a celebration rarely seen during the regular season. Sullivan was elated, "It was just a matter of trying to get open, and (Suter) made a great pass. We're in a dogfight for the playoffs, we needed two points, and we knew it." Pekka Rinne played a solid game, stopping 24 of 27 shots including three in overtime. When questioned if he would be ready to go on Sunday, Pekka said that he would. Barry Trotz would not commit to the goalie versus the Wings saying that he would access how Pekka felt on Sunday morning. The Predators now have points in their last seven games going 4-0-3 during that span. They still are without Captain Jason Arnott, David Legwand, and Ryan Jones. Steve Sullivan commented on what winning without them meant, “It is a real big deal. We would love to have those guys back in the lineup. That being said, there are twenty guys in the lineup that put the jersey on and go to war every night and all have the same goal in mind and that is two points. We’ve gelled really well together and rallied together to try to go as long as we can and hope those guys get healthy and get back in the lineup”. The win left Nashville alone in seventh place a point ahead of Edmonton and St Louis and two points ahead of Anaheim. The Predators are in a position to control their own destiny as long as they continue to win. The Predators have their work cut out for them over the next week. They left immediately after the game to travel to Detroit for a 4:00 p.m. game Sunday afternoon. From there, they travel to Columbus for a game on Tuesday, to Chicago for a game Friday and then back home on Saturday for a match with Columbus. If the Predators play well this week, they should be much closer to clinching a playoff spot. With things as tight as they are, it is almost a certainty that the chase will go to the final days over Easter weekend. The Nashville Predators game vs the Los Angeles Kings on Saturday will start two hours earlier than usual at 5:00 Central so that the Predators and the Sommet Center can join with several hundred Nashville businesses and thousands around the world in order to commemorate "Earth Hour" at 8:30 p.m. local time worldwide. There will also be a concert on the Sommet Center plaza immediately after the game featuring Jo Dee Messina. More details on the whole affair can be found here. For all the Tweeters in our readership, Jo Dee is alleged to be an avid Twitterer at @jodeemessina. Congrats to ReTweetBot founder and Predfans Twitter group leader Paul Nicholson and his wife Christy in the birth of their son today at 12:29 p.m. CDT. Ian Patrick Nicholson came into the world weighing 9 pounds, 8 ounches and was 20 1/2 inches long. Blessings on Paul, Christy and baby Ian! The Nashville Predators played one of their best 60-minute games of the year and defeated the San Jose Sharks 3-2 on Thursday night to move back into eight place in the tightly bunched Western Conference race . The Predators, playing with an injury depleted line up, started out with a lot of energy and jump, keeping the puck in the San Jose defensive zone for much of the first period. A questionable high sticking call at 14:45 against Scotty Nichol set up a power play goal by Joe Pavelski to put the Sharks up 1-0. The Preds out shot the Sharks 10-7 in the first stanza. The Sharks scored again on another power play 3:12 into the second period on a goal by Devin Setoguchi to put the Sharks ahead 2-0. The officials had called Jordin Tootoo for boarding on what appeared to be a clean hit. He was immediately hit by a couple of Shark players who received no time in the box. Coach Barry Trotz was biting his tongue after he game on the two penalty calls, but said, “The first penalty, I think it was it was actually Zanon’s (not Nichol’s) stick that hit the player, on the second I was a little disappointed because I didn’t think Toots did much, but they called it and they had two or three guys going in and bumped him, run him over and punch him and all that, and I felt at that point it should have been evened up, but we can’t worry about the referees, if you are in the penalty box, it’s a penalty”. Barry Trotz was confident even with the Preds down 2-0, saying, “The first period was maybe one of our strongest periods that we’ve played in a while, we were down 1-0. I didn’t think they had anything other than the power play, for the most part for two periods. After the first I kept saying, you keep doing what we were doing in the first, keep the pace, keep pushing it and things will fall into place”. I’m sure the ever confident coach wasn’t expecting what followed. The Preds went on the power play on a Jody Shelley hooking penalty at 7:02 in the second and Radek Bonk scored 32 seconds later to start the comeback. A couple of minutes later, Marty Erat scored to bring the contest into a 2-2 deadlock. The final item in the trifecta was 39 seconds later when Greg Zanon buried a shot from past the slot for the game winning goal. Zanon, who had three goals on the year coming into the game, described the shot, “It wasn’t a hard shot, I was just trying to get it on the net and I know Toots was near the hash marks, and I don’t think he saw it, and it hit his pads and kind of went in. It’s one of those things we work on just to get pucks to the net.” It was Greg’s first game winning goal of his 222 game NHL career. The Predators played tenacious defense for the remainder of the game and kept pushing the puck into the Sharks defensive zone. The Preds out shot the Sharks 33-31 on the game but the Preds were much more aggressive throwing the puck in the vicinity of the net as they has 13 shots blocked and 15 misses compared to the Shark’s 10 and 7. The shot gap closed substantially in the third period when the Sharks were playing desperate hockey. The normally aggressive San Jose squad was visibly tired after having lost in overtime in Chicago the night before. One of the more telling statistics was that the Preds out hit the Sharks 38-19. Steve Sullivan summed it up after the game, “They were a tired team tonight after a long game in Chicago, so we took it to them early and often in the first period, and carried that momentum well into the second period. Even though they had the 2-0 lead, we thought we were the fresher team and if we kept going after them good things would happen”. Pred goaltender Pekka Rinne again had a stellar performance. Pekka did not allow an even strength goal, stopping 29 of 31 shots. Ryan Suter was called for cross checking at the 17:30 mark in the third giving Rinne one last shot to hold off the league’s third ranked power play unit. When asked what were his thoughts he replied, “Probably not too much, empty mind, you know, the guys did a great job, a couple of big blocks by Greg Zanon and Jerred Smithson, and then I made a couple of stops, you don’t really think too much, just try to bounce all over the place”. The Predators played without the services of Captain Jason Arnott, David Legwand, Ryan Jones and Wade Belak. Cal O’Reilley was called up from Milwaukee and centered the second line for much of the night finishing with a plus one rating. Barry Trotz spoke highly of O’Reilley’s effort, “I give a lot of credit to Cal coming in, relaxing, playing his game, but I give a lot of credit to Sullivan and Erat who sort of took him under the wing and said, hey, you’re going to get it done for us. That showed me a lot about our team, and what we talked about as a group of twenty, a Band of Brothers. We have eight more games and we’ll see where we finish”. The near capacity crowd played a big part in the game staying behind the team even as the Preds fell behind. Barry Trotz acknowledged that the crowd was a big motivator after the game. One oddity occurred after the Preds scoring surge when Shark goalie Evgeni Nabokov appears to have lost his cool and took a swipe at one of the snow shovelers during a TV time-out. The referees immediately descended on the scene to calm Nabokov down. The Predators ended the evening in eighth place in the West with 80 points, the same number as seventh place Anaheim, but the Preds have one less victory. Edmonton and St Louis are one point behind at 79 and Minnesota is at 78 points. The Predators return to action in a late Saturday afternoon match with the Los Angeles Kings. The game was moved up to 5 p.m. in order that the Predators could participate in the “Earth Hour” celebration where many downtown Nashville buildings will turn off all their lights for one hour starting at 8:30. The Preds then travel to Detroit, Columbus and Chicago on a trip that will require them to continue to play with the same level of intensity as the last couple of games. On Thursday night, Barry Trotz pulled another rabbit out of his hat to bring home the win. We will see how many more are residing in that big hat of his. The Nashville Predators return to the ice Thursday against one of their long time nemesis, the San Jose Sharks. The puck will drop at 7 p.m. at the Sommet center as the Preds fight for their life in the Western Conference playoff race. For fans clamoring for playoff hockey, there is no need to wait for April, as what is being played now is as intense as any post season ever will be. Tuesday night’s chess match with the Anaheim Ducks, where the Preds lost in the fourth round of a shoot out, was a battle from start to finish with true playoff implications. With nine games left and quality opposition every night, each game is critical. Three points separate the five Western Conference teams that are bunched between seventh and eleventh place and Dallas is only two points behind the pack. The Predators have gotten points in their last five games, but the last three were losses in overtime, where they only received a single point. David Legwand (pictured) stated the need for getting two points after Tuesday's loss, “We need to move forward toward Thursday and getting two points there. We’re coming down to the finish and it’s an exciting time of year, but we need to get two points every night. We need to do everything we can to get them". The value of points and level of competition has risen to each game being a potential “do or die” situation for both teams. Three-point, overtime games, are becoming the order of the day. Barry Trotz commented on the situation, “You do expect to have three-point games in a lot of ways. In some ways, it is part of the playoff run. Teams are desperate, teams are hanging in there, and teams are finding ways (to get points)”. The first two periods of play in Tuesday’s game was as good of a defensive effort by both teams as you will ever see in a game. Barry Trotz described it in a nutshell, “They (teams) were sort of jockeying, there wasn’t much room out there, teams were checking pretty well”. The Predators, playing without Captain Jason Arnott, have again become scoring challenged, causing an increased emphasis on defense. The Preds only have 16 goals in their last eight games going 2-2-4 during this most recent scoring drought. On Tuesday, Nashville did an excellent job of limiting Anaheim’s scoring chances by keeping the puck in the Anaheim zone. Trotz explained that it was strategic, “Part of the game plan was to do what we always do, to get pucks deep and skate and put pucks on the net”. The Sharks are in a different kind of battle chasing the Detroit Red Wings for the NHL’s President’s Cup, which is awarded to the team with the best regular season record. Along with the trophy goes home ice advantage throughout the playoffs. The Predators left nothing on the ice in Tuesday’s game using every bit of physical and emotional energy that they could muster. The extremely quiet and somber locker room was indicative of the effort that had spent during the course of the game. Barry Trotz will have his work cut out for him to resurrect the intensity that will be required to overcome the San Joses Sharks in Thursday’s game. Defense and goaltending is key at this time of year, but scoring more than a goal or two a game would give the Predators a much needed boost against San Jose. The keys to the game for the Preds will be to score early, limit the Sharks scoring chances, and to play with discipline and not put the Sharks on the man advantage. The time has come for Barry Trotz to pull another rabbit out of his hat. Legwand Out for Sharks Game John Glennon of the Tennessean reports that David Legwand will not play against the Sharks due to taking a puck to the face during Wednesday’s practice. He also surmises that Cal O’Reilly is on the way to Nashville as a possible fill-in for Leggy since he did not appear in the Milwaukee Admirals game Wednesday night with no other plausible explanation. It’s good to have John back on the Preds beat after a week off during the Pred's recent West Coast swing. The Nashville Predators fell to the Anaheim Ducks 2-1 in a game decided in a shootout. Teemu Selanne scored the only goal in the one on one shooting in the fourth round. Radek Bonk followed with a chance to continue to another round but failed to lift the puck over Duck Goalie J S Giguere’s pad ending the hard fought contest with the Ducks getting the extra point. Anaheim’s victory moved the Ducks ahead of the Predators into eighth place in the Western Conference. Both teams have 78 points but the Ducks benefit from one additional win to move into the final playoff position. The game was a tightly played game right from the opening puck drop with both teams playing a very guarded style, not wanting to make any mistakes. The first period was scoreless with the Ducks out shooting the Preds 5-4. The second period produced more of the same type play with a few additional shots on goal. Anaheim finally broke the scoring drought at the 17:38 mark on Drew Miller’s third goal of the year which came on a wrist shot directly in front of the Predator goal leaving Pekka Rinne unable to defend. The Preds out shot the Ducks 9-8 for the period. For most of the first two periods, the Predators were making a conscious effort to keep the puck in the Anaheim zone to limit the Duck’s scoring chances. Shea Weber commented on the game plan, “Obviously a skilled team like that you want to keep the pucks in your hand and play behind their defense and that’s going to limit their game”. The third period produced more up and down action and more aggressive play on the Predator’s part. Shea Weber scored the game tying goal at the 4:12 mark on the power play when he blew the puck past Giguere on a slap shot from the right face off circle. The Preds continued to pepper the net out shooting the Ducks 15-4 for the period. Weber’s goal was his 20th, becoming the first Predator defenseman to crack the 20 goal mark. The Sommet Center really had a playoff feel to it as the game progressed. During the game’s final TV time out, the crowd cheered nonstop for the entire stoppage in play urging the team onward. Barry Trotz acknowledged the crowds support in post game comments. The game ended tied 1-1, setting up a brisk five minute overtime, where both teams had scoring chances but failed to bring home a victory. In the shootout, the Preds elected for Anaheim to shoot first. The Ducks sent Corey Perry, Ryan Getzlaf, and Bobby Ryan on to the ice. The Preds countered with Vern Fiddler, Steve Sullivan and Marty Erat, all of which came up empty. Sullivan had the best opportunity to score but caught a post rather than net. Teemu Selanne’s one on one game winning encounter with Pekka Rinne was something that Rinne had dreamed of as a young hockey player growing up in Finland. “He (Selanne) was always my hero, watching the national team games, he was a big idol for me. It’s been nice this year to face him a few times”, commented Rinne. I would imagine those youthful dreams had a different result. Rinne played an excellent game stopping 18 of 19 Anaheim shots. Defensively, the Predators played one of their best games of the year, having few breakdowns that have left net minders vulnerable to odd man situations. Barry Trotz remained positive after the loss stating, “It’s about collecting points. Obviously we would like two, and we didn’t get that, but every night that you get points, that’s what you need”. The Predators have posted points in their last five games, but the last three games have been overtime loses. As the Predators prepare for Thursday’s encounter with the San Jose Sharks the players know what has to be done. Steve Sullivan put it in perspective, “It’s a deadlock race and we’re right in the thick of things so we’re excited to have this opportunity with nine games to go”. The puck drops at 7 p.m. Thursday and the lineup should be similar to the one on the ice tonight. It is doubtful that injured Predators Jason Arnott, Ryan Jones, and Wade Belak will be able to return. Having Radek Bonk play his first game in over a month was a boost but the team remains without key components that are critically needed for the nine game stretch run. As the Nashville Predators approached the 2008-2009 season it was painfully obvious that the team was short on experience and needed additional bodies at the scoring positions. Through 72 games the Predators are ranked 25th (out of 30 teams) in scoring at 2.50 goals per game. Last season the team finished a respectable 12th at 2.77 goals per game. The Predators, to everyone’s surprise, have done a complete turn around since early February, rising from fourteenth place to eighth. Much can be credited to the return of Steve Sullivan who has sparked the offense as he has returned to his pre-injury point a game pace over the last 20 games. One unexpected and unheralded shining star for this year’s Predators team has been Joel Ward, a 28 year old winger from North York, Ontario. The 6’1” 220 pounder has been a career minor leaguer who suddenly blossomed into a key two-way player for this year’s team. Ward has taken an unusual route to the National Hockey League. After a four year junior hockey career, he attended the University of Prince Edward Island, a school that has only sent three alumni to the NHL. The Atlantic University Sport League, in which UPEI competes is also not known for quality talent. From there, Ward played three seasons with the Houston Areos AHL franchise before being released at the end of last season. He did have a brief uneventful call up to the Minnesota Wild in 2006 but was sent back to the minors after eleven games. General Manager David Poile of the Predators took a flier on Ward and signed him to a free agent contract last July when all the top name free agents had been signed by other teams. Ward came to the Pred’s camp in September and impressed everyone with his hard work and positive attitude. He easily made the Predator squad and has steadily improved his game as the season has progressed. Over the last few weeks, with injuries to Jason Arnott and Radek Bonk, Ward has risen to a new level of importance on this Predator squad. Ward’s 15 goals and 15 assists on the offensively challenged Predators team have been a huge contribution. During last week’s critical trip to the West coast, Ward was the offensive star scoring four goals and adding an assist. He is also sixth in the league in shots blocked at the forward position and has maintained a positive plus/minus rating throughout the season. While not the original answer to the scoring question that the Predators were looking for, Ward has been a versatile player that has played on all four lines, has been a stalwart on the penalty kill unit, and is one of the few on the Predators team that has the ability to maintain position in front of the offensive net, in what Barry Trotz calls “the hard places”. If the Predators hold on to their eight place position and make the playoffs, Joel Ward will be one of the key reasons due to his solid two-way play, being the hardest worker on the ice, and for being a great team player to have in the locker room. Sometimes great things happen to good people as has been the case for Joel Ward this season. Preds vs Ducks Tonight's game with the Anaheim Ducks visiting Nashville will be a true test for the injury ridden Predators. When the puck drops, being inside the playoff picture will be on the line as the Ducks are one point behind the eight place Preds. The game is a critical test for both teams in the crowded Western Conference playoff picture. The Predators are expecting the return of Radek Bonk from an upper body injury. Ryan Jones suffered an off ice injury and is considered day to day but will miss the game against the Ducks. Captain Jason Arnott and Wade Belak will also be out with no official time frame for return. With the injuries and the tough schedule remaining, the deck appears stacked against the Preds to make their fifth straight playoff appearance, but for Barry Trotz that scenario seems a familiar time for him to pull yet another rabbit out of his hat. Note: If a portion of this article seems somewhat familier you will receive a reward for paying attention. I actually rewrote and updated an article from about ten days ago publication in The Daily Herald to bring more of a focus on Joel Ward. Who can argue with more Joel Ward, eh? After an episode of miss communication with a scheduled guest, Monday night's edition of PredsOnTheGlass Radio was far and away our best show yet. It had nothing to do with Jackson and I, but was attributable to our guest Mark Willoughby. Mark is a day one Preds season ticket holder that has a passion for the Predators like few others. He is the writer for The View From 111 which he says is "A Fan's View of Hockey, Sports, and Life". He is an incredible storyteller and has lots of tales to tell. He recently was able to accompany the team on the four game west coast trip and saw the Predators in a way most fans can only dream of. During the show he described the whole trip and relayed insights and memories that any person interested in the Preds would love to hear. Please click on the BlogTalkRadio button on the right of this page and give the show a listen. It will truly be a blessing to you once you check it out. Thanks to Mark for joining us for this week's show. After a few days with no games while the rest of the Western Division catches up with the "games in hand" it appears that the Predators will hit the ice on Tuesday hanging on to eighth place. That is truly amazing to me considering not that long ago we were in 14th place and weren't looking too spiffy. We have a very special out of town guest on Monday's PredsOnTheGlass Radio show on BlogTalkRadio. Our good friend in Edmonton, Neils Bristow, has made arrangements for Jason Gregor of Just A Game - The Team 1260 to appear on POTG radio to discuss the race for the playoffs between the Oilers, the Preds and the rest of the Western Conference. Jason Gregor is the guru of Edmonton's sports radio scene. He delivers post-game interviews and daily stories in his own unique style. His show runs 3:00-6:00 Monday through Friday. You can check out his web site at Just A Game. We can also announce that Mark Willoughby from "The View from 111" blog will also be our special guest to discuss his travels following the Preds on the just completed west coast trip. As far as the cheat sheet we have a long list of news items that we have come across. As always the lead story is the last week of Predators action and the current playoff chances and standings. Here's what the official Preds site says. Our main eyes and ears on the trip were thosse of Mark at the View from 111 who did a great job as an unpaid road correspondent. Injuries have played a big part over the last couple of weeks and it appears Bonk will return on Tuesday and Arnott won't. Belak is also questionable and since Tootoo got mauled and was last seen sporting a visor, it is unknown who will defend the team against the Ducks who lead the league in fighting majors. There was also a big stink over the last few days where the Tennessean jumped the gun to allege that the Preds were $400,000 behind in taxes and it turned out that it wasn't true. Another off ice story involved owner Herb Fritch hiring counsel to deal with the DelBiaggio mess. Still another story discusses naming rights and sponsorships and includes the Preds. The Tennessean seemed really busy on the off-ice front but had very little of substance about the Preds on the trip. Paul McCann was even criticle of their coverage in the middle of his post. I've been wondering about the weird 5:00 start for Saturday's Kings-Preds game for a couple of months. Rachel clears that up over at What The Puck. We will try to touch on that. Paul McCann also has an update on the topic and news of a concert on the Plaza after the game. I'm not sure how that save energy. Tuesday is autism awareness night at the Preds game. I got an invite to the Preds Wine Tasting Event next month. I probably won't make it. From the farm, Jonathon Blum and Chet Pickard have picked up honors. The Hockey God over at the Red Light District gives some food for thought as he gives names the most critical player for each team down the stretch for both the East and the West. Guess who Nashville's is? Boo to this one. Scott Cullen at TSN ranks Pekka as the sixth best rookie in the NHL this year. Consolation prise is five in the top 100. The Hockey News discusses the league's 10 best line combos. No Preds here. Surprised? James Mirtle is good for a cpouple of mentions. The third part of his ever growing Nashville series and a really nice piece about hockey scholarships to minor players who don''t make it. The Globe and Mail has a good story on the history of how many points it takes to get into the playoffs. Here's one that gives a different slant on salaries and caps. With escrow payments players are getting far less that the announced salaries and it will be worse next year. The NCAA brackets were announced Sunday with Boston U getting the top seed and Notore dame not too far behind. More analysis is here. Pred fans will be excited since soon to be Predator Colin Wilson plays for BU and may win the Hobey Baker Award. Pred Prospect Ben Ryan had the game winning goal in ND's last two wins. ESPN also weighs in on the field. In all four Preds are in the final field. John Glennon also adds this. Not to leave out the women, Wisconsin took home the ladies title. We can't go without mentioning Marty Brodeur's record breaking night and Ovie's 50th. Shawn Laveigne at XM204 has a good article on how the media is tainting hockey's big moments. Another good rant that I gave the thumbs up to is Chriss Wassel over at the program. Our friend Paul Nicholson and soon to be mom Christy are featured in Predator Radio ads. As a final thought, I don't know why I did all this as Dirk at On The Forecheck has the best info and week wrap-up anywhere at his site. 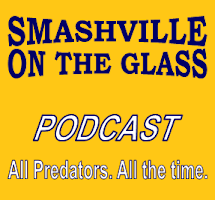 Last but not least, thanks to Smashville for our spiffy new PredsOnTheGlass Banner. Check out his other masterpieces over at On The Forecheck. His stuff is better than what the Predators pay good money for. My advice to the Preds... hire him! I will probably add to this list on Monday so check back for more interesting links and stories. James Mirtle takes a look at Selke Candidates with 10 games left. The Preds are well represented in the top 30. If the playoffs started today, the Preds would meet up with our favorite, the Sharks! Grim news from the Forchecker - Preds have toughest road to the playoffs of all contenders. John Glennon of the Tennessean returns with bad news, Jones out on Tue and Sulzer headed for surgery. You were missed. John also appeared on XM204 this afternoon with Mike Ross and Espo. Welcome back John! Puck Daddy has an article up with Six Reasons why the Ducks get in. Thanks to Smashville for the New Graphics! See more of his excellent work available for download at On The Forecheck. The Nashville Predators saved their best effort for last on the four game road trip and came away with another point as they lost 3-2 in a shootout to the San Jose Sharks. Jonathan Cheechoo and Evgeni Nabokov provided the offensive and defensive heroics in the shootout for the Sharks. The Pred’s critical swing to the West coast has to be considered a success by any measure as they collected six of the available eight points on the trip. The Predators were going into a lion’s den in San Jose where the Sharks were 27-3-4 for the season. The Sharks intensity was magnified after a 90-minute closed-door team meeting on Wednesday. The Sharks saw the need to refocus on the chase for the Presidents Cup after a streak of below average play in the last few weeks that allowed Detroit to pass them in the Western Conference race. The game started with San Jose clearly out skating the Predators. A slew of unnecessary penalties, two by the Preds and one by the Sharks, led to a five on three advantage for the Sharks and their first goal by Rob Blake at 14:27 in the period. The goal by the Sharks put the Preds back in the league lead in five on three goals allowed, with eleven on the season. The Preds turned a rather innocuous shot from the blue line into a goal at 16:40 when it was tipped by Joel Ward to give him his 15th goal of the year. A little over a minute later, with the Predators on the penalty kill, Vern Fiddler picked up a mishandled puck at the Sharks blue line and skated full out to the Sharks net and blew it past Evgeni Nabokov into the roof of the net to put the Preds ahead 2-1. The Sharks rebounded with four seconds left in the period when Milan Michalek picked up a loose puck during a mad scramble to the left side of Pekka Rinne and put it in the net over the sprawling Rinne. The Sharks out shot the Preds 14-8 in the period. The second period started with a very effective forecheck by the Sharks that really limited the Preds chances. A brutal fight between Jordin Tootoo and Brad Staubitz at 7:39 in the second left Toots bloody and headed for the dressing room for repairs as he was pounded repeatedly primarily by elbow shots to the face. Staubitz called the fight “a battle” on the post game show. A holding penalty against the Sharks shortly after the fight produced a flurry of shots by the Preds on the man advantage but no score. The Predators played much better in the period but were still out shot by the Sharks 12-11. The third period began with both teams playing spirited hockey. Ryan Jones missed an opportunity to put the Preds ahead at 4:38 when Nabokov was out of position and he missed the open side of the net with a wide-open shot. The Sharks went on the power play at 7:00 when Scotty Nichol was called for holding and the Preds shut down the Sharks who had zero shots during the man advantage. Jordan Tootoo returned to the Pred's bench during the PP with a face shield that drew a few smiles from the San Jose bench. A great save by Pekka Rinne on an open shot by Jonathan Cheechoo at the 14-minute mark was the save of the game. With less than four minutes left, David Legwand had a chance to bury the puck on Nabokov on a breakaway and a rebound but could not convert. As the clock wound down it looked like the Preds were playing for the overtime point until a final attempt by J P Dumont with 4.8 seconds left almost found the net. Regulation ended tied 2-2 with the Preds gaining a point. After a scoreless five-minute overtime, the shootout ensued. Joe Pavelski shot first for the Sharks and went high to score. Vern Fiddler followed with a backhander to tie 1-1. After Dan Boyle and Steve Sullivan missed, Jonathan Cheechoo scored the game winner as he roofed the puck over the glove of Pekka Rinne. David Legwand’s final effort to tie was batted away by Nabokov to seal the win for the Sharks. Pekka Rinne had another fabulous game stopping 38 of 40 Shark shots including four in the overtime period. Rinne received second star honors for his strong play. The Ward, Fiddler, Dumont line provided all the scoring as they continued to work well as a unit. The overtime loss left the Predators with 77 points and in eight place in the Western Conference. Unfortunately, several of the teams who have played fewer games will finally get the opportunity to play this weekend while the Preds are idle with the opportunity to move them out of the top eight. The Predators returned home immediately after the game and will have a period of four days with no games before playing the three California teams again at home starting Tuesday with a rematch with the Anaheim Ducks. Hopefully, Jason Arnott, Radek Bonk, and Wade Belak can use the days off to recover from injuries and make it back to the lineup by the puck drop on Tuesday. With ten games left, the Predators probably need another seven wins to seal their playoff position. Until Tuesday, they are left to relax, prepare, and take in a weekend of scoreboard watching. The Nashville Predators fell to the Anaheim Ducks 4-3 on an power play goal by Teemu Selanne 34 seconds into overtime. The game was a back and forth affair where five of the seven goals were scored on the man advantage. The Predators started slowly and allowed the Ducks to score first, 4:19 into the game on a goal by Corey Perry. Joel Ward followed with his first of two goals on the power play at 10:09 to leave the score tied 1-1 at the end of the period. J P Dumont scored early in the second on another PP goal to put the Preds in the lead. Scotty Nichol was called for tripping at 9:27 on a play where Chris Pronger actually man-handled Nichol and looked to be the one that should have gotten tagged with the penalty. Andrew Ebbett made the most of the situation, scoring at 11:13 to tie the game 2-2, which is where it stood for the rest of the period. Joel Ward was whistled for an uncharacteristic tripping call at 10:58 in the third, setting up Bobby Ryan’s 24th goal on the power play at 11:38. Things were looking grim for the Predators until Joel Ward deflected a shot by Shea Weber into the net with 2:45 remaining to force the game into overtime, somewhat atoning for the earlier penalty. The Ducks fans were not pleased with the call which was reviewed for a high stick allegation. As the game wound down, Vern Fiddler was called for tripping Chris Pronger near the net at 19:11 to put the Ducks on the man advantage through the end of regulation. The Preds were able to hold on through the period to gain a point in the standings before yielding to Selanne in the extra period. The game was a very uneven affair with both teams looking good and bad at times throughout the game. It was difficult to tell if it was playoff type intensity causing the differences or if both teams were out of sync at times. The one thing the Predators did not want to do was spend time in the box and give the Ducks opportunity on the power play. Unfortunately, undisciplined penalties were the Pred’s undoing. The line of Ward, Dumont and Fiddler played an excellent game offensively, racking up three goals and an assist. Ryan Suter extended his point streak with three assists while Shea Weber added two helpers. I know it sounds like a broken record but Pekka Rinne played another solid game in spite of taking the loss. Three of the Duck goals were on the power play and there were simply more open players around the net than our third ranked penalty kill should have allowed. Surprisingly, the only fight between of the game was really hard to even call a fight as Mike Brown and Scotty Nichol mixed it up for a few seconds before Brown basically fell on top of Nichol after they swapped a couple of swipes at each other. This was a game that both teams really needed to win to stay in the Western Conference playoff race. Reflecting on the game, it could either be a half full or half empty glass of water type situation. While Pred fans and players really wanted the two points, the reality is that we did get one and head in to San Jose Thursday night with five of the six points available so far on this trip already in hand. Barry Trotz announced before the game that injured centers Jason Arnott and Radek Bonk would not play in San Jose. Wade Belak had already been sent home prior to the game. Patric Hornqvist had been recalled before the came and was basically a non factor in his return to the team. With the point, the Predators moved back into seventh place with 76 points. With eleven games remaining, they will probably need seven wins to get in the playoffs. One advantage the Preds do have is that they have more pure wins, which is the first tie-breaker, than the teams chasing them. As close as it has been, there’s no reason to believe that it won’t come down to a tiebreaker when all is said and done. The Nashville Predators didn’t have their best game defensively but managed to play just well enough to defeat the LA Kings 4-3 Monday night at the Staples Center. Ryan Jones had the game winner with 2:18 in the game to put the Preds ahead for the final time. The game was in question until the final seconds as the Kings took advantage of a questionable Steve Sullivan interference call with 1:31 remaining to play the final minute with a six on four advantage. Having failed earlier in the game, the Predators penalty kill unit held firm in the end to seal the victory. The Kings scored first in the game, taking the lead at 14:42 in the first period on a Dustin Brown missed shot that hit the left pole, crossed the crease, and was knocked in on the rebound by Anze Kopitar. Pekka Rinne made an incredible attempt to stop the puck but it still managed to slip across the line off of his extended left leg. The whole play was set up by a turnover in the Pred's offensive zone and the ensuing odd man rush. Shea Weber scored his record breaking 19th goal with 15 seconds left in the period to tie the game. His goal broke the franchise high for goals by a defenseman. The Kings started the second period by being called for a hooking penalty on a move by Wayne Simmonds at the 25 second mark. The ensuing power play produced a Joel Ward goal at 1:24 to put the Preds ahead. Another Pred's defensive breakdown led to the Kings second goal on a power play at 16:25 in the second on a shot by Edward Purcell. Steve Sullivan came back with a goal to retake the lead 1:45 later to end the second period with the Predators holding a 3-2 lead. In the third, at 9:53 the Kings were able to tie the game once again when the Pred's defense allowed Pekka Rinne to be completely screened on a shot by Michal Handzus. The game remained tied until Ryan Jones picked up a rebound and made a nice move in front of Kings goalie, Erik Ersberg for the game winner. This was another Predators victory that was difficult to watch. Not only was it a late night for the viewing faithful, there was never a reason to feel confident or comfortable in the outcome. Basically, the Predators played just well enough to win. It was not one of their better games and would have not had the same outcome with stiffer opposition. The victory moved the Predators into seventh place in the tightly contested Western Conference race. The loss for the Kings may have put to rest any playoff hopes for this year as they are now five points out of the playoffs and have a murderous schedule down the stretch. There were several unsung heroes in the game for the Predators including David Legwand, filling in for the injured Jason Arnott, Dan Hamhuis with six shots, Jordan Tootoo with five shots, and the entire team for the group effort in out-hitting the Kings 30-26.Jerred Smithson also carried the load in the face off circle winning 13 of 21 draws. Pekka Rinne was outstanding in stopping 26 of 29 Kings shots, many after defensive break downs that left him as the last man standing between the Kings and the net. Joel Ward continued his steady development as a two way player and should have received a star of the game. J P Dumont left the game early after two assists on a non call where he was clearly boarded into the wall. It appears that it was not serious and that he should not miss any games. The status of Captain Jason Arnott and Radek Bonk is still unclear as both are on the trip and hoping for a return. The Predators will return to action Wednesday against the Anaheim Ducks before traveling to San Jose on Thursday to complete the four game swing to the coast. Points in both games are critical as the Preds will be off for four days over the weekend with no chance to add to their point total. Credit needs to go to Barry Trotz and his staff as well as the players who have risen from the dead in late January to be in the thick of the wild and woolly Western Conference playoff picture. A win like this one in LA really makes you think that this may be a team of destiny. Maybe Barry does have another rabbit in his hat this year. Time will tell.